The Context Trigger sample application demonstrates how you can manage contextual rules using the Contextual Trigger API. 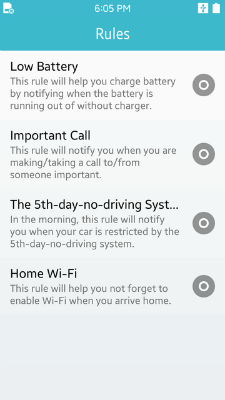 The application displays several rules in a genlist. You can tap each list item to start or stop the rule. When a rule is triggered, a notification is posted with an appropriate message. The following figure illustrates the main view of the Context Trigger. Use the app_create() callback function to initialize the Context Trigger sample application. Register the contextual rules with the add_rules() function. The following example shows how to create a rule handle for a battery rule and to register the rule. When the Context Trigger application is terminated, the app_terminate() callback function is called, and all registered rules are disabled and removed in the remove_rules() function. An enabled rule can be removed after being disabled. The genlist is created using the elm_genlist_add() function. For the genlist to be displayed properly, a genlist item class has to be created and defined with the elm_genlist_item_class_new() function. The following code snippet demonstrates how to set the item class properties. The text_get() and a content_get() callback functions are defined for creating the item text and layout. The genlist is filled with rule items. To append items to the genlist, the elm_genlist_item_append() function is invoked for each Eina_List item. The application's rule_data structure contains its rule information, such as name and description. It is later passed on to the previously defined callback function. The following example shows the _gl_text_get_cb() and the _gl_content_get_cb() callback functions. The rule information is retrieved from the parameter and used to create the item layout. When a genlist item or a check button is clicked, a corresponding rule is enabled or disabled. If the user taps a rule item which fails to be added, an error popup is shown to indicate the error reason.